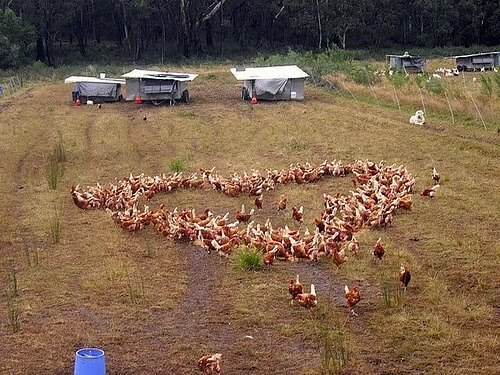 daylesford organics: Chook love art. Produced, directed, photographed, fed and tended to by Farmer Pierre. That is one of the best things I have seen in a while! Thank you. what role did the dog play in the production...Oh I know1 Body guard to The Stars or maybe set security. You guys need to put out a calendar with all your gorgeous vegetable and animal pics. That’s a beautiful herd of chooks spreading the summer joy. How fun was the shoot? OH MY GOD!!! I LOVE IT SO MUCH IT HURTS!!! How did they herd the hens?? LOVE IT!! I'm so jealous...I want chickens of my own but my neighborhood association may just get mad. I may try for them anyway and get lucky. Best photo!! I have to put this on my facebook page! Crimes of Farm Fashion Part 2.